Out with Skybeam, In with WifiElite! I finally gave up on Skybeam and now use WifiElite broadband. Much faster, doesn’t drop several times a day, etc. What I found really interesting is they were willing to do the installation even though everything here is covered in several inches of snow! Here’s a photo … and … a video! 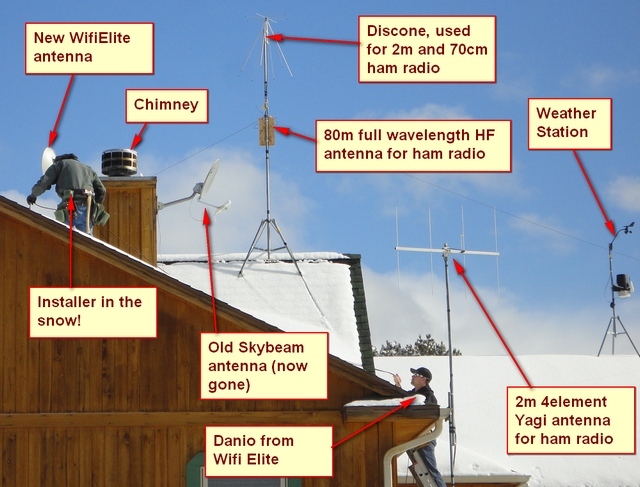 WifiElite installs the new antenna on Dec 28th. Note the snow–lots of snow! And I thought it might be fun to do a little video. Some of the video is still photos and some is live video. I tried to get the transitions to match the beat! This entry was posted in Computer Tips, Product Reviews and tagged broadband, SkyBeam, WifiElite. Bookmark the permalink.